Teenager Clary Fray (Lily Collins), after witnessing a murder in a nightclub that apparently no-one else can see, soon learns she is of shadow-hunter descent. This propels her into a world she never knew existed, as her mother (Lene Headey), a shadow hunter herself, is attacked by mercenaries of a man called Valentine who is after a mysterious item known as the Mortal Cup. Teaming up with new found friend Jace (Jamie Campbell Bower) and long term friend Simon (Robert Sheehan), Clary must fight off evil in order to get her mother back and save the world. It all just sounds a bit familiar, right? I mean..magical worlds that others don't know about is a bit Harry Potter, vampires and werewolves sound a bit Twilight, even the whole initiation-like introduction Clary has to her new life sounds somewhat Divergent. But, when some effort is actually placed into this film, it really picks up. When it starts thinking for itself, and trying to become something better, there are genuine signs of promise; it's just a shame these signs are trapped within an onslaught of clichés, horrible acting and a pretty nonsensical story. With the exception of central star Collins, the acting is pretty diabolical throughout. Robert Sheehan's Simon never once feels like he's genuinely in love with Clary, he just gives the impression of a schoolboy crush emphasised through jealousy. However, worst in class lies with Campbell Bower, who here has granted us one of the weakest, most agonizingly terrible performances in a very long time. Not only does he sound bored, uninspired and generally forced throughout the film, he retains the same facial expression from start to finish. His face does not change. From the moment he appears in the nightclub, to the film's final moments, he constantly resembles a large fish at feeding time. Wide mouthed, wide eyed and generally lacking any expression. Is it too late to have him replaced for next year's sequel? There's also the tackiness of the film. With teen-book adaptations, this whole romance thing is sort of a given now. But with other entries, such as last year's The Hunger Games, this romance subplot is smartly handled; we're never entirely sure whether it is real or not, and we have to follow the story to be told whether to believe it. Here, it is annoyingly simpler. She loves him, he loves her; deal with it. Oh, and, naturally, there's some complication giving us what is known in the business as a "love triangle". Even though we already know each character's feelings for each other. There's just no need for it. There are also a handful of incredibly overused and unfunny "jokes" scattered throughout the film. Maybe in the script these were legitimately funny, and the actors' themselves couldn't carry them off, but on screen, every attempt of humour is about as funny as Jace's face is expressive. Which, as made clear earlier, is not at all. But, when the film reaches it's second half, it surprisingly really picks up. once the cast don't have to do much acting and the CGI takes over, City of Bones becomes a refreshingly dark film, with a number of intelligent twists and turns that are genuinely unexpected. There are even a few themes here and there that other teen-book adaptations wouldn't dare go near. The CGI, on the whole, is generally well produced, and the final act sees the violence boosted to places I wouldn't expect in a 12. There are throat slittings and all. At 130 minutes long, it's a bit of a trouble to sit through, and the first half feels more like 130 days, but once it hits the end of the second act, it flies through to credits. Once the action picks up, everything else does too, and that's not usually a common thing. It's hardly the best thing to come out so far this year, and it's bound to be completely forgotten about by the time Catching Fire is released in November, but it is better than you'd think it would be. With a possible five more instalments on the way, let's hope the producers can sit down and realise what made this film work, and what didn't quite fit. This way, next year when City of Ash is released, we can enjoy a CGI ridden story, with loads of clever twists and awesome action scenes. Preferably without Jamie Campbell Bower. 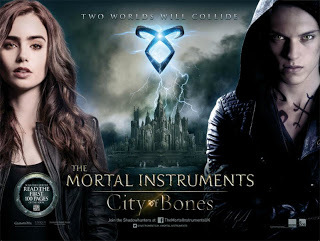 To Summarise: It struggles with a diabolical opening act, weak acting and cliché ridden script, but "The Mortal Instruments: City of Bones" is a satisfyingly dark, occasionally enjoyable teen book adaptation.